Here's the little menace rooting for grub. I took a much needed vacation last week to Birmingham to visit Shellie and Rob and meet a friend Shellie had introduced me to. It was a grand old time, and now I’m sad to be back at work in the real world. This was too good not to share. Enjoy their misery. (Not really misery, I guess, since you can see they have a sense of humor about it.) I just wish I was there to help them. 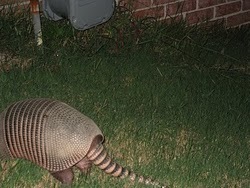 Or watch them scare the armadillo. Best vacation ever. Thanks for sharing. Very funny saga. Someone should be taping all this for u-tube! Should we send our traps to Birmingham?